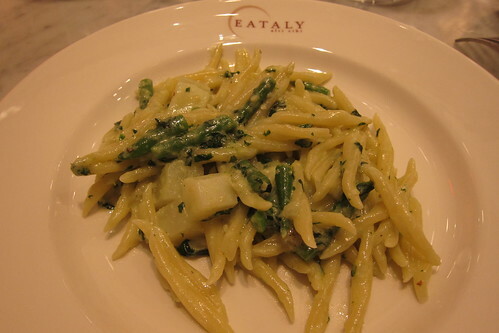 As part of Barilla's Summer of Italy in New York, they've been giving classes in our fair city's newest Italian mecca, Eataly. As one of their sponsored brand ambassadors, I got the chance to attend the class this past Wednesday. Chef Lorenzo Boni was there, teaching us how to make simple, yet delicious pasta dishes, including another lesson on the making of pesto-a lesson that I *really* needed! 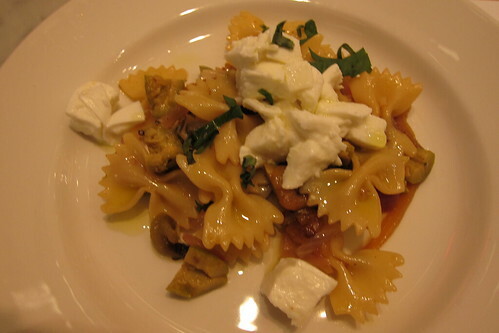 The first course was Insalata di Farfalle con Peperoni Arrostitti e Mozzarella. Of the three, this meal could take the longest, simply due to the fact that it calls for roasting peppers and then marinating them for a hour. I was pleasantly surprised by the combination of the capers and anchovies, maybe I'm developing a thing for the later. If you're looking for a nice cool and impressive pasta salad for a holiday BBQ, I suggest you look no further. The flavors all went nicely together, and plus everything's better with fresh, soft mozzarella on top. Next up was a dish that I had almost been making on my own, Troccoli con Verdure e Pecorino Romano or pasta with roasted vegetables. One of the meals firmly implanted in my dinner rotation is the Pasta alla Norma I made last winter. You simply dice up eggplant, toss it with olive oil, roast in the oven at 400-425°, and toss it in with pasta and sauce. For the past few weeks, I've been roasting the eggplant along with my CSA bounty of zucchini. Chef Boni takes this one step further and roasts oyster mushrooms alongside the two vegetables! He did give me the good suggestion of roasting each separately since their times vary. Also, right as you're plating your dish, placing the herbs and Romano cheese on top, drizzle a bit of good olive oil just for taste. The last dish was where I sat up and really paid attention. Maybe it's because I've received more basil than I know what to do with, maybe it's because it's been so hot and I'm a bit lazy, but this summer I've been trying to perfect how to make a decent pesto. I just can't seem to get it right. So when Chef Boni whipped out a mortar and pestle to make pesto-this is gentler on the basil's taste than a food processor-I tried to make mental notes. Trofie Liguri con Pesto alla Genovese (the recipe is very similar to this one) is another impressive, yet one pot meal. 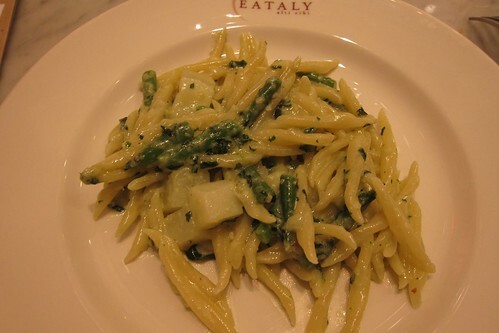 While making pesto on the side, you're boiling the pasta with diced potatoes and green beans. Once finished, everything is tossed with the sauce. In all of thirty minutes, and I'm including prep time in that, you have a nutritious and delicious dinner! Can't beat it! 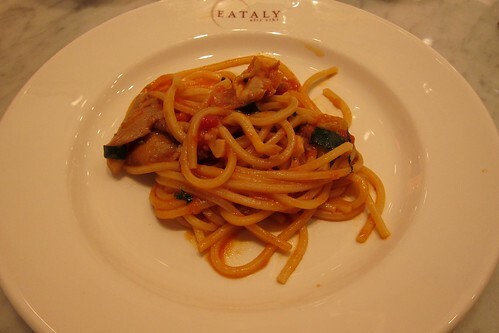 If you're interested in taking another one of Barilla's classes at Eataly, there are two more coming up. Click here to sign up! Full disclosure: I attended this class on behalf of Barilla. I am a sponsored and compensated Brand Ambassador for their Summer of Italy initiative. My Italian fam loves Barilla so I guess that means it's legit. This looks delish! @Much to My Delight: I know, too many dishes. Or you can put them in at different times. Tonight I roasted beets and zucchini, placing the zucchini in right at the end. @A-Tooch: Apparently Barilla has over 40% of the Italian market. I'm definitely learning about all their different shapes in Europe, some of which are at Eataly!